The Display tab allows you to customize how the Media should display on the Box. You can be creative on this one, really! Set the position of Box on page, before or after content. Insert HTML, for example video embed code or even embed a flash game. Display videos using WordPress supported embeds. Display a single image by uploading to media library. Display images with built-in slider. Use a shortcode to display image slider from any other plugin. Fields override each other in a descending order, this means if you uploaded an image then decided to use a YouTube video, the video will override the image and other fields below it. When using YouTube videos, the video thumbnail will be used automatically in schema markup output and in plugin add-ons. 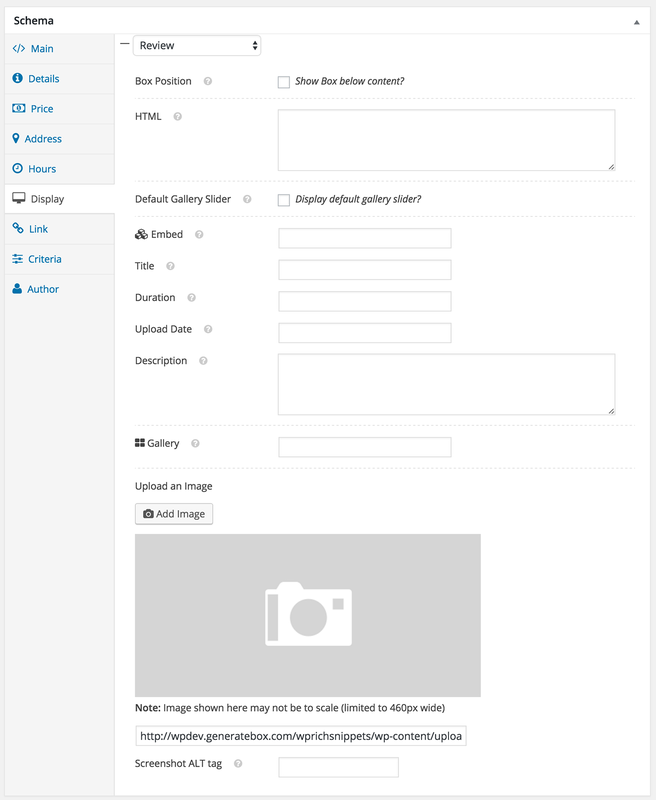 The Gallery field is used for shortcodes, you can upload several images using the media uploader then use the built-in WordPress gallery shortcode (example: gallery) or use any other slider shortcode from a third-party plugin.